There’s a polyester mullet skirt gracing a derrière near you. It’s short at the front, long at the back, and it’s also known as the hi-lo skirt. Like fads that preceded it, the mullet skirt has a short fashion life, and although it will remain potentially wearable for years, it’s likely to soon be heading to the charity shop or to landfill. The mullet skirt may not last more than a couple of months as a fad, but the fast-fashion trend has shown considerably more longevity. With Spanish brand Zara compressing lead times to as little as 13 days, and the UK’s Topshop releasing 300 new styles a week, fashion trends are being captured and sold far quicker than ever before. However, the garment’s price tag does not acknowledge the environmental and social cost of overconsumption. In the UK, some 30 kilograms of textile products, per person, per year go to landfill. What isn’t sent to landfill goes to charity. A single Smith Family sorting centre in New South Wales sorts 10000 tonnes of donated clothing each year. Much of this will be sent to developing countries, a trade that can be disruptive to local textile industries. The two most popular fibres for fashion apparel – cotton and polyester – each have considerable ecological impacts in production. Conventional cotton alone accounts for one quarter of global pesticide use, linked to poisonings and air and groundwater contamination. 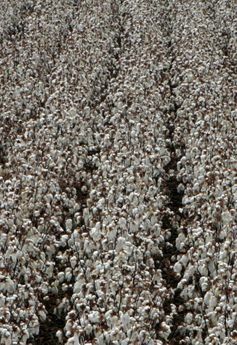 In addition, cotton requires a global average of 11,000 litres of water per kilogram, to produce. Crucially, fast fashion is not merely fast material throughput of garments, but a sophisticated global image and information system which, to some degree, is weightless. As fashion is intangible, it is not necessarily tethered to the purchase of new clothing. An example is The Uniform Project, in which blogger Sheena Matheiken wore the same dress for a year, styled in 365 different ways. With this perspective, a fast-fashion company’s role may evolve into that of a service provider, not simply a retailer. These services may include styling advice, alterations, clothing libraries or collection of the garment at end-of-life. 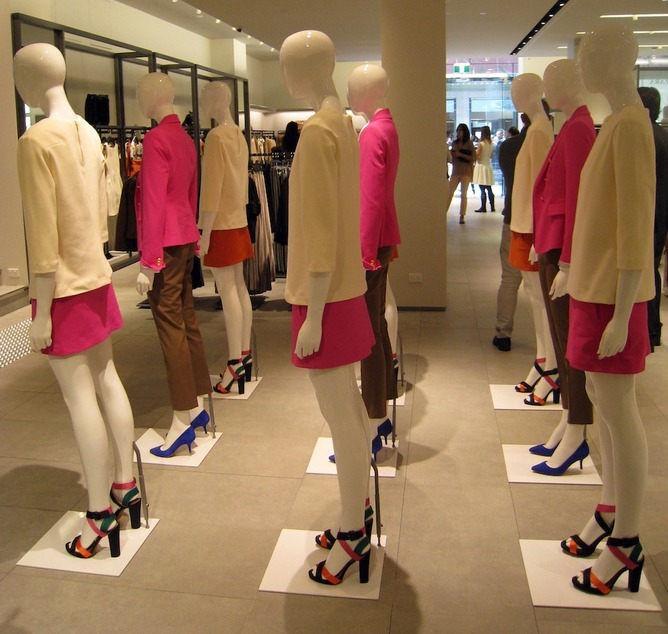 There is no contradiction in fast-fashion retailers selling second-hand clothing, as the speed of trends mean that styles come in and out of fashion so frequently that some version of “vintage” style is always in style. Within the context of fast fashion as ‘post-brand’, second-hand styles simply become additional grist for the mill, as consumers will mix and remix the product (of whatever provenance) in their personal, restless search for novelty and individuality. Fast-fashion principles also drive the success of online marketplaces such as eBay, in which second-hand clothing can be circulated again and again, revalourised by individual consumers. Similarly, the Salvos charity stores in Australia and Oxfam in the UK, now sell second-hand fashion online, grouped into ‘lookbooks’, complete with fashion shoots. While the Rococo excess of a new frock a week may be unsustainable, a different fast fashion – one that relies less on overconsumption of new garments and more on the inventive reuse of existing materials – can emerge. Alice Payne does not work for, consult to, own shares in or receive funding from any company or organisation that would benefit from this article, and has no relevant affiliations. What that 'red dress' symbolises: The psychology of fashion. The image above, currently circulating on the internet, shouts fashion psychology more than people realise. Red and white outfit. Red and white flag. First it’s not just a woman in a dress. It’s a woman in a red dress. And she’s carrying a white shoulder bag. This colour combination mimics that found on the Turkish flag. So this image will have a more powerful, albeit subliminal, impact on Turkish people at this time. Secondly, the red dress has more resonance than any other colour. As well as being the colour of passion and love, red is the symbol of female fertility. In many species redness conveys that the female is ready to mate. 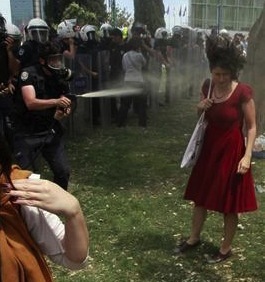 So the image packs another punch; this young, fertile female is the mother of the next generation, of the future of Turkey. Look at the style of the dress too. It isn’t a shift or a smock. It flares from the waist. This emphasises the women’s waist-to-hip ratio, which is about 0.7. That's the ratio that, on women, has been shown to correlate strongly with fertility. Had she worn a blue dress, or a t-shirt and jeans, this image would not have been so powerful. Nor would it, I suspect have gone viral around the globe. This woman was largely unaware of the power of what she was wearing. Just as most of us are when we reach into our closets every day. When she chose her red dress and grabbed her white bag that morning, it could have been a mere coincidence. But unconscious forces may have been at work too. We don't always understand why we wear what we wear, but our choices are rarely accidental. And they will be psychologically motivated. And what about the guy firing tear gas at her? Research shows that his black uniform will have made him more likely to behave aggressively. His masked face will have reduced his sense of personal accountability. It will have lowered his threshold for expressing inhibited behaviours. By hiding behind his anonymity he was able to unleash his aggression on her. Was he drawn to her because of what she was wearing? It's possible. Although we do know from the indiscriminate firing of tear gas at protestors that she certainly wasn’t singled out for this treatment. Yet the image stands out not just because of the appalling actions it depicts. The strong visual imagery reaches deep within us too. We look at it and we process the action in the photograph at a conscious level. But unconsciously the signals in the characters' clothing also have intensely powerful emotional resonance for us. It's tempting to dismiss fashion as mere fluff. Until, that is, we start to decode its many meanings and marvel at what it reveals.